Are you a young professional or entrepreneur interested in gaining valuable insights for how to grow your career, expand into new markets, or open a successful business? 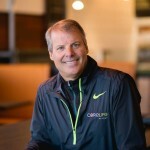 Join us for a guided Q&A discussion with CoreLife Eatery co-founder Todd Mansfield about the challenges and rewards of opening CoreLife. Todd will provide insights and takeaways for young professionals that can be applied in many facets for advancing career and business objectives. Attendees will enjoy 50% off meals purchased during/after the event! Additionally, STYP members in attendance will be eligible to win a $25 CoreLife gift card! 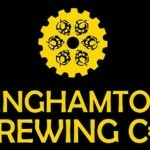 Join STYP for a mid-summer mixer at Binghamton Brewing Company! Stop by and check out their new outdoor beer garden, enjoy complimentary appetizers/food, and network with other young professionals at this locally owned brewery! 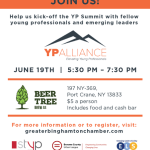 Help us kick-off this year’s YP Summit at a fun event with fellow young professionals and emerging leaders! Includes food and cash bar!